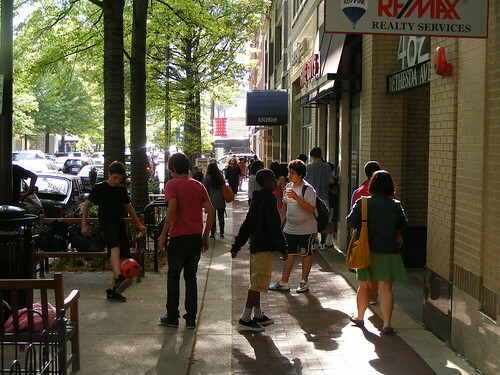 Teens enjoying fun, wholesome activities in downtown Bethesda. Last week, County Executive Ike Leggett proposed setting a curfew for young people under 18, preventing them from being out in public after 11 during the week and midnight on weekends. Though Leggett says the measure will curb gang violence, police statistics show that crime in Montgomery County has been dropping for years. Not surprisingly, the public is skeptical: the Gazette ran an editorial saying there are "too many questions" about the curfew to implement it now, while a "Stand Up to the MoCo Youth Curfew" Facebook group has 4,777 members as of this morning. I understand that people are upset. There are bad people in the world, and we hear about the bad things they do. We hear about gang violence, and delinquent youths, and damaged property. And I understand that this fear may make curfews seem like a good idea. But we can’t give in to fear. Because the final sign that criminals have beaten us is when they manage to convince us that we should confine a large segment of our population for no reason other than their age. At that point they’ve gotten us to shut people out of their own communities. And communities are a powerful, powerful thing. As Dan pointed out, creating more gathering spaces helps teens turn their attention to constructive and safe pastimes, and public spaces create social pressure to act within the law. But there are other ways the community of Montgomery County can engage teens. Although elected officials and adults are constantly worrying about gang activity and delinquency among kids, they almost never involve the actual kids in these discussions. There have been concerns about gang activity and other crimes at nearly every MCPS school I’ve attended, but the only time I remember a teacher talking to the students about these problems is a health class spent listening to a series of bloody urban myths about gang initiations. My classmates and I were left cringing or bored, not engaged in solving a problem that was affecting us just as much, if not more than, the adults. In California, the Gang Violence Suppression Program helps communities fight crime while showing young people another way. The state-wide program provides grants for local governments to ramp up law enforcement and prosecution, while giving parents, teachers and at-risk youth tools to prevent the growth of gangs. This method was highly successful, because it allowed community leaders to fight gangs while showing young people meaningful alternatives to gang involvement. The lesson: if you empower teens to make the choice to not break the law, they'll encourage their friends to do the same. Invest them in the community so they’re less likely to want to damage it. And when teens trust law enforcement and government officials, when they care about where they live, the two groups can work together to make the county a safer place to live, instead of enacting a curfew that would alienate all youths in the name of penalizing a few. With young people and adults working together, it will be much easier to combat youthcrime in a way that, unlike a curfew of questionable legality and efficacy, has been shown to work. Dan mentioned that crime has been going down in Montgomery County. A closer look at police statistics from this year reveals that Part II offenses (which include juvenile crime) have gone down as arrests for Part II offenses has gone up. We don't need a curfew to reduce crime when existing laws are already doing so. It's clear we just need to step up their enforcement. If you’d like to join us in opposing the curfew, we would love it if you signed our petition. You can also attend a public hearing on the proposed curfew at the Council Office Building, 100 Maryland Avenue in Rockville, on Tuesday, July 26 at 1:30pm. For more information or to testify, check out the County Council's website. Great article. I've noticed that across multiple posts against the curfew that has been little to no discussion regarding the efficacy of curfews (locally and nationally). Is that because it is effective, because there isn't definitive evidence one way or another, or because efficacy doesn't matter? Honestly, effectiveness is what it comes down to for me when it comes to this curfew, as well as other restrictions based on age (driving, alcohol and drug use, etc.). If it isn't effective then of course it's not worth pursuing. If it is effective at taking a chunk out of crime, then personally I think the trade off is worth it in this case. I would say the jury's out on the effectiveness of curfews. I found studies that say they work, but there are also studies that say they don't work. Regardless of your opinion, I'd be more interested in a discussion on the effectiveness of curfews in reducing crime rather than a "you kids get off my lawn! "-style rant about how kids stay up too late. I agree that studies are inconclusive on whether curfews reduce juvenile crime. But this is a strawman argument. The police are asking for the curfew as a specific tool to break up large gatherings of youths. This in response to a July 2 incident when about 60 gang members, many apparently from outside the county, were disruptive in downtown Silver Spring. I applaud Abigail and her young colleagues for looking at this issue. We need their input to address the gang problem. The males study and specific studies of the PG and DC curfew laws have shown that curfews don't reduce crime. There are also studies that show curfews lead to an increase in racial profiling. There are already laws that would have enabled the police to break up that gathering, such as loitering laws. We're talking 11pm on weekdays and midnight on weekends. Honestly, shouldn't kids be home at that time anyway? There are exceptions to the curfew rule, if the kid is out with his/her parents or at a school event. I don't see this law as being oppressive. It's basically giving the police something they can use in the case of a big group of teens starting to get too wild. The police are now saying that the curfew would be set at midnight all week throughout the summer months and then go to 11 Sunday through Thursday during the school year. There also is likely to be an entertainment exception so that teens can go to movies and concerts that extend past the curfew hour. Teens would only be cited if they refused an order to go home. A curfew would only make otherwise law-abiding kids and parents into criminals. Surely we have enough laws already to deal with kids whose behavior is actually causing problems. A curfew is like speed bumps. They inconvenience lots of people because of the poor behavior of only a few. A curfew would do the same thing. By the way, I'm the parent of a now-adult child and would not be directly affected by a curfew, but I still think it is a repugnant idea. While I don't think Curfews are the be all end all in this matter, its a start. The other measure is creating a no loitering law. THere are countless degenerates that malinger around DTSS and just hoot and holla like wild beast. Both boys and girls.